Now that we have entered the new year, it is time to start planning out for the rest of 2019. 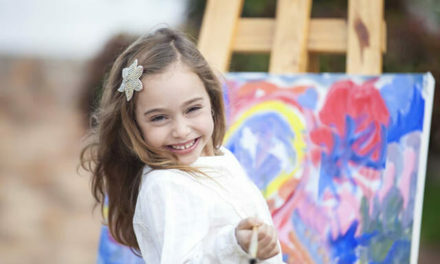 When it comes to our children’s playtime, summer can offer a lot of chances to conduct fun outdoor activities. One of the most enjoyable activity kids can do during the hot summer days will always involve water. However, not anyone can afford to go to the beach or the pool regularly. 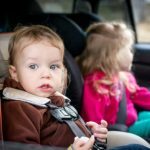 So, what is the next best alternative for your toddlers? A nifty water table, of course! While Slip n’ Slide and inflatable pools have always been the norm for a fun summer-centric activity for children, these toys are usually appropriate for the bigger/older kids. What about toddlers? Water table fills in this space by offering your child a way to enjoy simple yet fun water activities without the common risks of using a Slip n’ Slide and inflatable pool. Water Tables are also known to promote creativity in toddlers which helps in their cognitive development. Water Table is a great summer specific children’s toy that not only offers them a way to stay cool but also help sharpen their creativity, problem-solving skills, attention, and focus Water tables can come in a variety of shapes, sizes, and design/themes. This pretty much guarantees that you will find one that your toddler will thoroughly enjoy. Some water tables are also large enough to accommodate a couple of toddlers. This should help develop your child’s communication skills during playtime with their friends. Water tables can also help introduce your child to the physics involving water such as how it flows around the table. In this article, we will be discussing the various factors and aspects that makes water tables a highly recommended toy for children during their developmental stage. We will also comb through factors you should consider if you decide to buy your toddler a water table for summer. So, sit back and relax as we take a look at this fun and creative summer toy for children. Water tables are not just designed primarily for children to pass time with. It actually offers a slew of benefits to a still growing and developing toddler (http://www.parkchildcare.ie/five-surprising-benefits-of-water-play.html). I will be listing down all the benefits your child can obtain from playing with a water table. 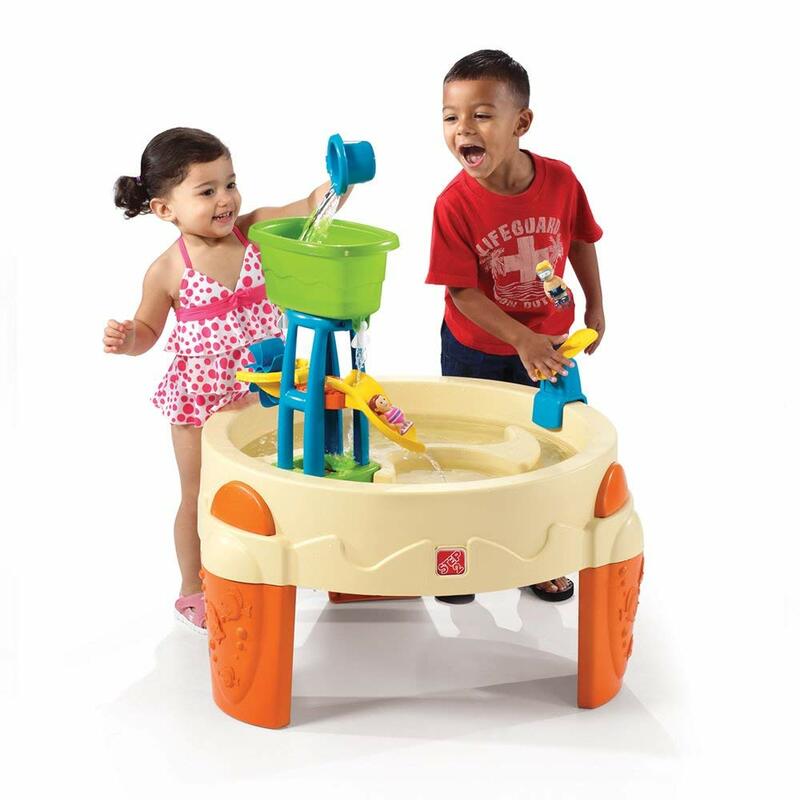 Water table offers toddlers a great way to have fun within the comfort of your yard or garage. 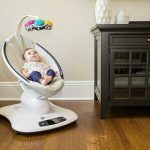 This means you will be able to easily supervise your toddler. Water tables can also help cool your toddler down during summer as they play and splash water around. Water tables are designed to be easily cleaned and stored after use. However, I do recommend you place a tarp over the water table to help prevent damages caused by natural elements over time. The water table is great for imaginary play and will help enhance your child’s creativity and imagination. This is way better than them staring at a tablet screen the entire day. Playing with their water table alongside their friends will help improve your child’s social skills. It can also teach them a lesson in sharing and working together with their friends. Most water table features attachments that require toddlers to scoop and pour objects into specific areas of the water table. These extra accessories and playsets are designed to develop a child’s hand-eye coordination. Water tables can be a great learning experience for toddlers. They can experiment and observe how water flows. Certain water tables even have spinning cogs and wheels spin when pushed by water poured at specific points. What is the recommended age for water tables? Water tables are primarily designed for toddlers 2 to 5 years of age. It is an ideal summer activity for toddlers with siblings thanks to its wealth of offerings in terms of creativity and opening up communication between playmates. Can water tables be filled with objects other than water? Yes. However, if you are using water tables with basins that utilize the plug drainage system you should be careful of what you fill it with. This is because objects can block the drainage system. If you want to avoid blockage problems, you can also purchase an additional plastic container that you can feel with sensory objects such as sand, pebbles, seashells, and pasta (https://nurturesmart.org/what-are-sensory-toys/). Now that you have an understanding of the benefits water tables can offer your toddlers, I think it is only fair to go one step further and give you a list of the best rated and highly recommended water tables in the market today as well as how to choose the right one. I compiled this list based on personal experience as well as their overall positive feedback from dozens to hundreds of satisfied customers. I also applied the guideline I wrote earlier when choosing the water table for kids in this list. So, without further ado, here are the best water table for kids that you can buy today. 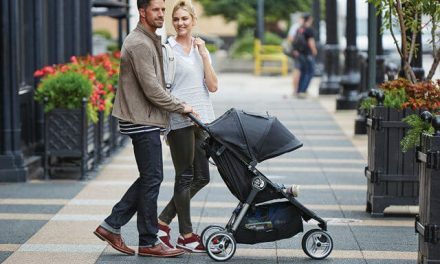 The Step2 Big Splash comes with a variety of accessories to ensure your toddler will get hours of fun alone or with a playmate. It comes with a total of 7 accessories ranging from buckets, figurines, and even a catapult board. It features water wheels and funnels as well as a spacious middle basin for water play. The basin uses the drain plug design for a rather quick and easy cleaning process. This is made from durable plastic which ensures it will last for quite some time. It also features three wide legs which improve the overall stability of the water table. The Step2 Big Splash is also large enough to accommodate up to 4 toddlers at a time. The base table is also low enough for smaller toddlers to play while the highest part is designed for taller children. Overall, the Step2 Big Splash is an ideal water table for those with multiple children and prefer something that is extremely easy to clean up. Large enough to accommodate multiple toddlers. Another entry from Step2, the Water Wheel Activity Play Table offers a simpler design. It features only a few moveable attachments but this allows it to feel sturdier. The design incorporates different water sections such as lakes, canals, harbor, and a mote. It uses two exceptionally wide base legs for perfect stability. As for additional accessories, the Water Wheel Activity Play Table comes with a cup, two mini-boats, and a water wheel attached to an elevated platform. This water table is also exceptionally lighter as it weighs around 10 pounds, give or take. The size of the water table makes it ideal for younger toddlers (preferably 2 years of age). However, it does utilize an elevated platform for taller kids to play with. The Step2 WaterWheel might be a good choice as a durable introductory water playset. Easy to assemble and lightweight. The wide two-legged design will have trouble maintaining stability if significant weight is added onto the table. If you wish to include more sensory play options for your toddler then you might want to take a look at the Step2 Naturally Playful Sand and Water Center table set. It not only features a basin for water but also an equally large area that you can fill up with sand. It also comes with an attachable umbrella making it perfect for an outdoor toy during the summer. 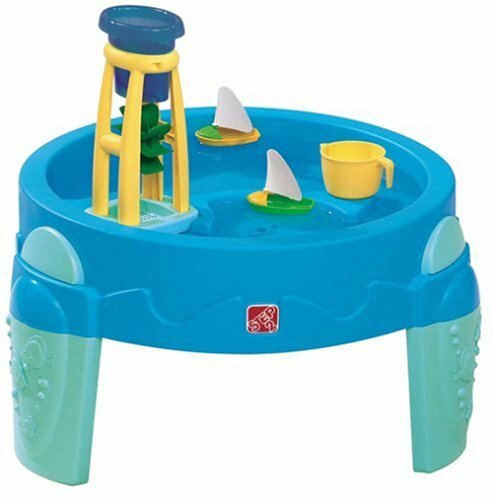 You won’t be needing to bring your toddler to the beach with this water table playset. 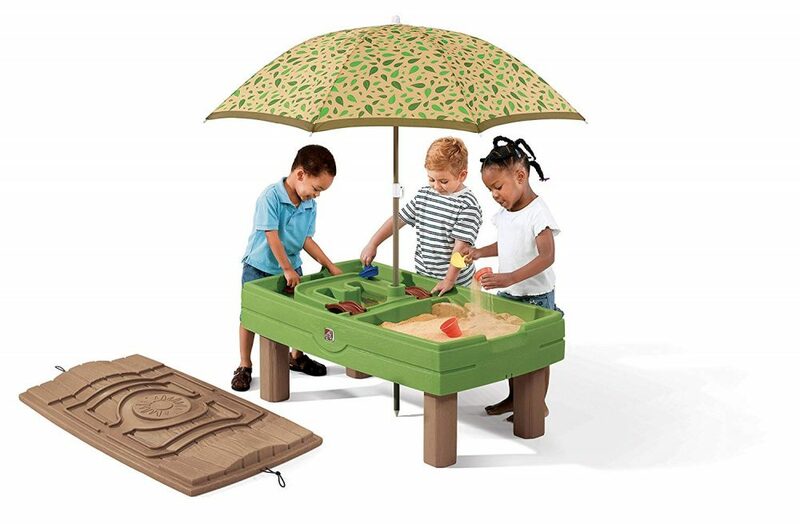 The Naturally Playful Sand and Water set come with 8 different accessories which include the umbrella, two mini-boats, a shovel, two bridges, and two cups. Design of the table itself combines reliability and convenience thanks to the detachable legs which mean tidying up and storage can be accomplished easily. The design of the Naturally Playful water table also sets it apart from the rest. It has a nature theme aesthetic and a cool looking faux wood design for its top cover. Speaking of, the top cover can be tied down to the table which secures it in place during storage. However, cleaning up the sand can be a bit tedious. Remember to completely remove all traces of sand on the table before storing it to avoid any odor from developing. You should also be mindful of the weight since the middle part of the table does not have any sort of support which can leave it with warped over time. Overall, this water table from Step2 is recommended for older toddlers or for those who have 2 or more children at home. Its large design can accommodate multiple toddlers and the aesthetic is pleasing to look at. Just remember to handle it with extra care. 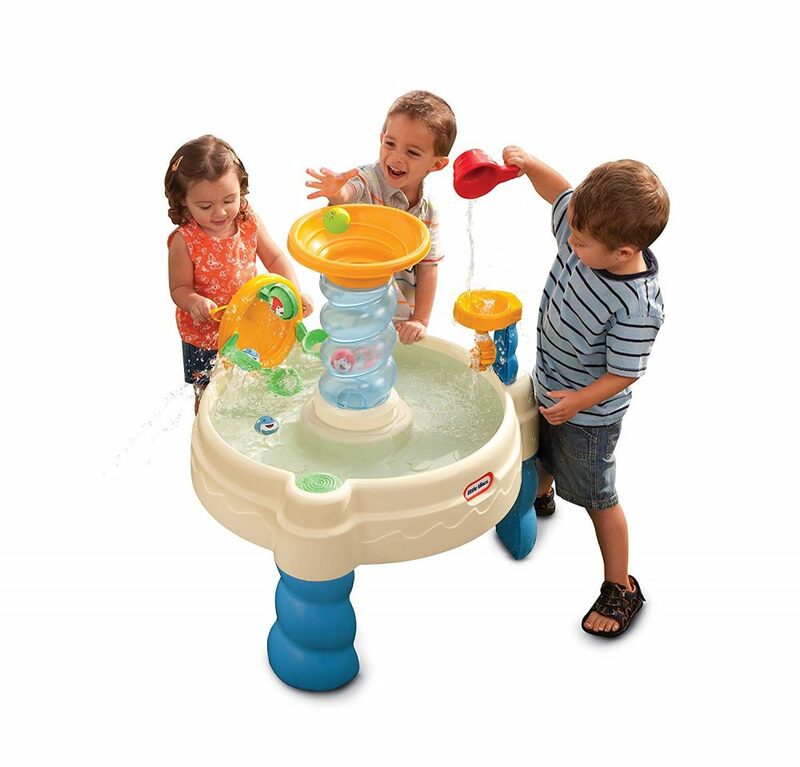 This water table can hold both sand and water for a toddler to play with. Comes with a detachable umbrella for protection from the sun. Cleaning out the sand basin can be a little difficult. The middle part of the table does not have any form of weight support. Be mindful of weight distribution. Your toddler and their friends will be singing “A Pirate’s Life for Me!” with this specially designed water table. Coming in with a nifty little pirate theme, the Little Tykes Anchors Away offers hours upon hours of fun for your toddlers. It features a variety of moving parts and even a water cannon that can squirt water. Additional features include an anchor that can be raised and lowered as well as a crow’s nest which your child can pour water into in order to simulate waves. 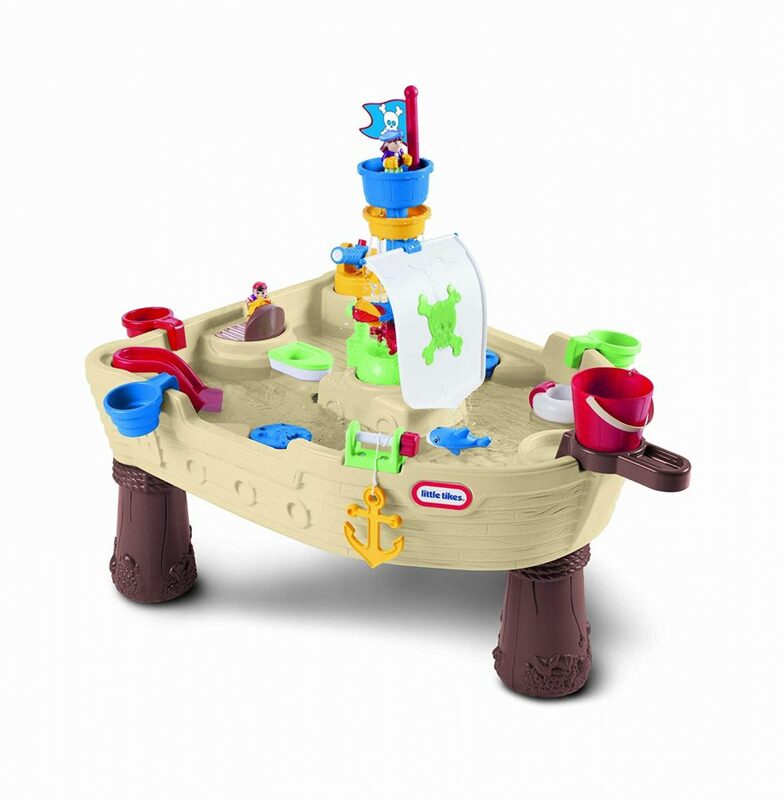 Not only does this pirate ship-themed water table come with some unique and fun designs, but it also does not skimp when it comes to extra accessories with buckets, mini figurines, shovels, and cups. I did find the drainage plug to be a tad bit awkward to secure, but once you’ve plugged it in it will stay in place. The Little Tykes Anchors Away is also on the smaller side of the spectrum so taller kids will need to sit down to comfortably play with it. I also recommend you place this outside as the water cannon is surprisingly powerful and will definitely make a mess. The Little Tykes Anchors Away Pirate Ship’s main selling point is its design and theme. It is a fun water table on its own and will definitely offer hours of enjoyment for your swashbuckling toddler. Comes with a variety of unique built-in attachments like the water cannon. Comes with large and brightly colored extra accessories. Corners can be a bit difficult to dry properly. Some accessories are not designed to be attached to the table itself. Designed to really catch the attention of toddlers, the Little Tikes Spiralin’ Water Table features bright and vibrant colors. Design features focus on motor skill development of children thanks to the water wheel and a spiral tower located in the middle of the table. It comes with colorful balls that can also squirt water when squeezed. The basin uses the drain plug design. However, the drain is not located directly in the middle of the basin so you might need to tilt the table around to completely drain the water reservoir. I would also like to note that some of the toy balls are rather small so I advise parents to supervise their children’s play time. This water table is highly recommended for younger toddlers who are still developing their motor skills thanks to its myriad of fun activities. Moving parts included in this water table is designed to develop fine motor skills. Comes with 5 toy balls that can also squirt water. The table’s legs feel a bit flimsy. The spiral tower tends to leak somewhat. As we have already discussed in the introduction, water tables are not just simple and fun ways for your kids to pass time during the hot summer days, it also improves on several aspects such as their problem-solving skill, communication, and cognitive development. Before heading out to your local toy store to purchase one, there are a couple of guidelines I would like to point out in order to ensure you get the best possible one. Check my guide on how to choose the best water table for kids below. First and foremost, you would want a water table that would last for quite some time. Keep in mind that this toy will mostly be used during summer. Afterward, it might not be as popular for your child once the temperature starts dipping again. You would want a water table that is built to last and can remain in pristine condition even after a certain period of storage. Smaller water tables can hold a gallon of water. While this might seem enough, remember that your toddler will most likely be splashing the water around. It is quite easy for them to spill half of the water content within 30 minutes of play time. Personally, I recommend you go for water tables that can hold more than a couple of gallons of water to prevent frequent refills while your child plays. Never choose a ‘one trick pony’ here. Look for water table for kids that offer a variety of ways to spice up their play time. There are water tables that have certain themes to their design. 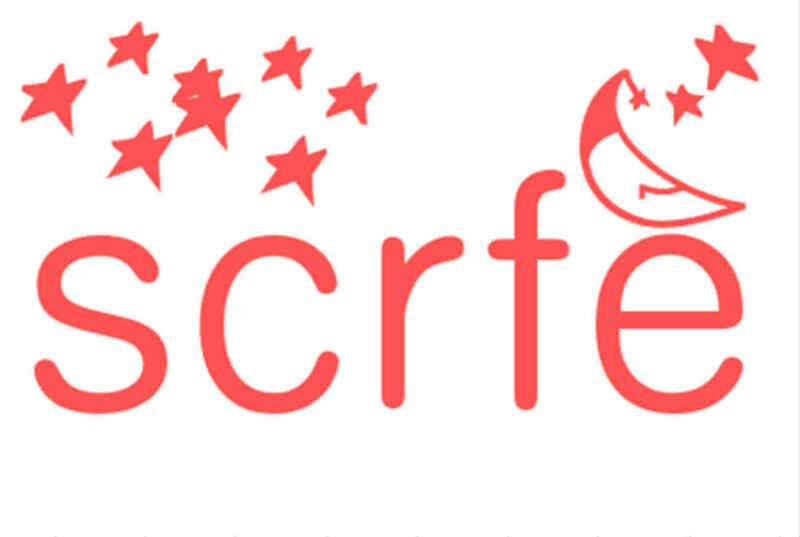 You should also look for water tables designed to be used in conjunction with other sensory objects like sand as well as different types of toys. This should help promote your toddler’s inquisitive nature as well as their creativity. You can choose from two different types of drainage system when it comes to water tables. You can either opt for the spill route or the plug drainage one. Each has their strength and weaknesses. For the spill drain, you will need to either remove the water basin from the table or (if it is built-in) tip the water table to pour the water out. Then we have the plug drain system which makes draining easier but is more susceptible to leakage as time goes by. A good preventive measure here would be to add additional sealant around the hole. Personally, I went for the plug drain system and simply improved the plug by applying extra sealant. How Many Toddlers Can It Accommodate? The standard water table for kids is designed to accommodate up to 2 toddlers. Of course, there are larger water tables that can accommodate more toddlers. If your child is planning on inviting a handful of friends over to play, I suggest you pick the larger one so that all of them will be able to enjoy the water table simultaneously. Finally, it is always important to ensure that any toy you give to your child is perfectly safe for them to play with. Make sure that all parts of the water table are made from child-friendly and non-toxic material. 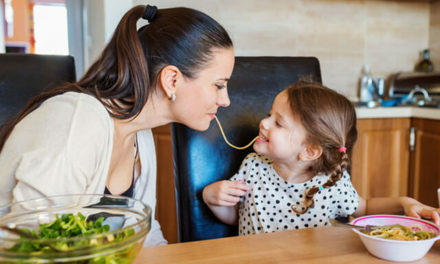 Look for water tables that utilize BPA-free materials (https://www.parentmap.com/article/toxic-toys) to guarantee that your toddler won’t come across any traces of lead, mercury, and other harmful chemicals. You should also check the edges to see if they have been smoothed out and rounded. 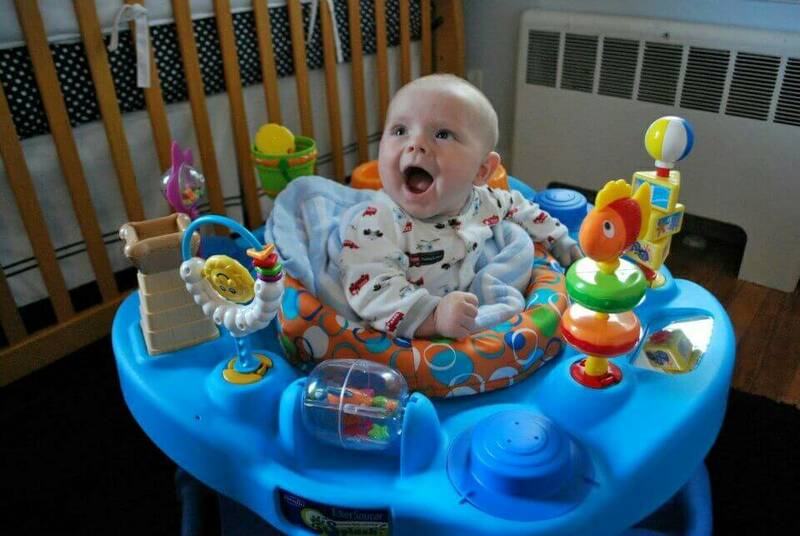 These are the basic factors you need to consider when choosing the best water table for kids. As long as you take this to heart when buying one, you are guaranteed to get the best possible one for your toddler. What Other Activities Can Your Toddler Do When Playing with a Water Table? The best thing about a water table for kids is that it encourages creativity. Sure, your toddler can simply just splash around and play with the included accessories but introducing fun activities will make sure there will always be something new to do. For example, I placed a couple of small rubber duckies on the ‘lazy river’ area of the water table that my children can use to race with. I gave each of them a small water gun which they then fire upon the rubber duckie which propelled it forward. Another activity you can do would be to use natural and safe food colorings. Mixing together different dyes can help introduce your child to colors. You can also add bubble bath soap to the water this can be a great sensory play for kids. If you want to go for a more scientific route, collect a variety of objects and see which of them sinks and which of them floats. Observe how quick some objects sink compared to others and ask your child why this is. Also, you can place a variety of other objects into the water basin like leaves, flowers, marshmallows, and even DIY colored ice. Let your creativity fly and help your toddler experiment with a variety of stuff when it comes to playing with their water table. Water table for kids play sets offer a variety of benefits to toddlers. Not only can they offer hours of fun during the hot summer days, but they are also designed to develop cognitive, creative, and even social skills. I highly recommend water tables for children ages 2 to 5 to maximize its benefits. Hopefully, this article has helped you understand the benefits of this type of toy for a child during the developmental stage of their life. 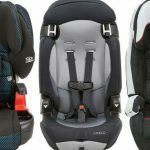 PreviousThe Maxi Cosi Pria 70 vs 85: Which Is Better For Your Baby ? The 8 Best Play Kitchen for Older Child Reviews: Make Playtime Better Now!